3. 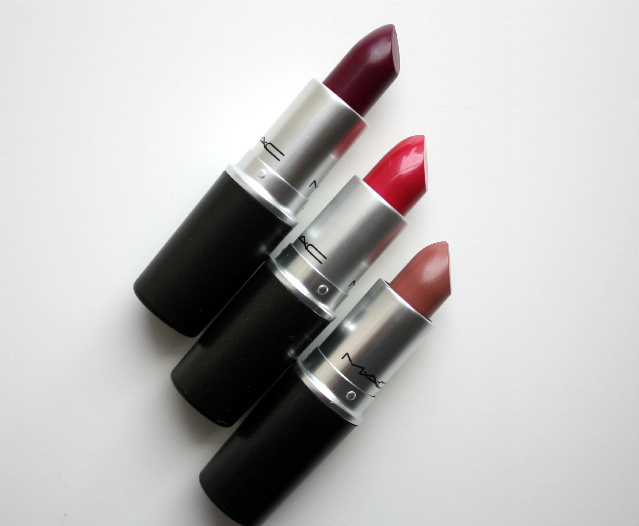 Leave a comment below this post letting me know your favorite MAC lipstick color. Please be sure to include you twitter handle for reference. 5. The contest ends September 15th at 11:59PM EST and the winner will be announced on my blog on September 16th, so be sure to check back. My Favorite MAC Lipstick Color Has to be Peach Blossom because it's not very opaque, has a natural color and hydrates my lips all at the same time. viva glam 5 is my favorite mac lipstick. So far my favorite MAC lipstick is.................................candy yum yum!!!! I have always been loyal to MAC Spice. Great neutral. Also loving RiRiWoo. I just started getting into makeup. I usually like a more natural look, but recently I'm into bright colors on lips. I love reds and bright pinks. My favorite Mac lipstick is Russian Red. It's the perfect, true red and I'm not afraid to wear it!!! Now that's it fall, I'm looking for that perfect wine color that will go with my olive skin tone. I'm loving the 3 colors that are for the giveaway! I recently started becoming brave and wearing bright lip colors. I like the more natural look but I am definitely loving reds and bright pinks. My favorite MAC lipstick is Russian Red. It's the perfect true red. Now that it's fall I'm looking into darker colors--browns and plum colors to go with my olive skin tone. Hope I get the chance to win! Good luck everyone!! :) twitter handle is _Natasha3. Instagram (use this more often) is NatashaBenitez. Thanks! Hands down MAC favorite is Viva Glam for any season! I love the Viva Glam Nicki Lipstick. 3. My favorite MAC lipstick color is Spirit. my favorite would probably be Please me. My favorite Mac lipstick is Candy Yum Yum! :) My twitter is ekatsarah. I also liked your fb page! My favorite Mac lipstick is Candy Yum Yum! I liked your Facebook page, and my Twitter is ekatsarah. My Favorite MAC Lipstick is SO Hard to choose, but I Would have to Say it's "HOT GOSSIP" <<<Very Natural Looking and everyday kind of lipstick. I have 2 e-mails, but I prefer to use and be contacted if I win at : jaimecardoza[at]comcast[dot]net if Possible Thanks! My favorite MAC color right now is Shy Girl.